Fettuccine with Grape Tomatoes and Basil in an excellent dish to end a perfect day. You can add some fresh mozzarella and call it a caprese pasta. Or better yet, top it with a little Gorgonzola cheese for some added flavor. If you don’t like grape tomatoes you can use sun-dried or chopped Roma tomatoes. If you want a little healthier meal just use whole wheat pasta. Whole wheat pasta is made from durum wheat and contains more protein than regular pasta. 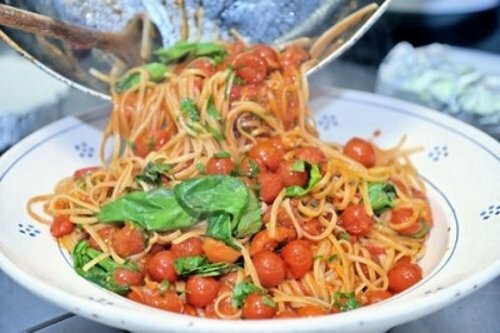 I’m sure once you make this Fettuccine with Grape Tomatoes and Basil dish it will become a family favorite for lunch or dinner. Enjoy. 1/2 cup of Gorgonzola or both. In a large pot of boiling salted water, cook the pasta al dente. Around 10 to 13 minutes. Meanwhile, heat the olive oil and butter in a large skillet. Add the onions and garlic and saute for around 2 minutes until the onions soften. Add the tomatoes and basil and heat through for around 4 to 6 minutes. Drain the pasta and add it to the pan and toss. Toss in the fresh mozzarella and season with salt and pepper.